One day I’m in a boardroom. The next, I’m driving an excavator on my ranch, covered in dirt. Gay Gaddis is founder and CEO of T3. Opened in 1989, T3 is one of the largest independent woman-owned advertising agencies in the country, with more than 200 employees nationwide and a growing roster of Fortune 200 clients. T3 is rated as a top innovation agency by a leading market research company. 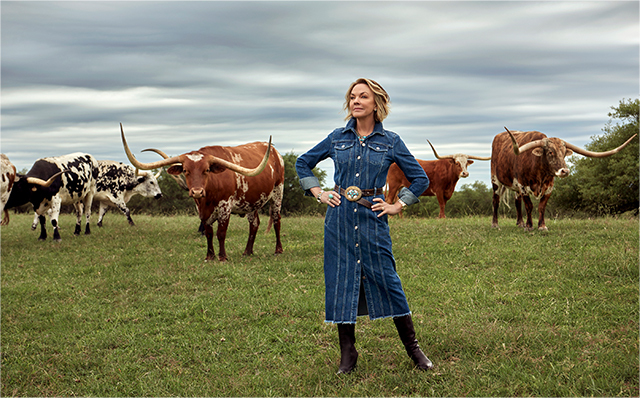 Gay is a proud mother of three and also the co-owner of the legendary Double Heart Ranch, a 900-acre working ranch in the historic Texas Hill Country. She has received numerous awards and honors including Fast Company’s “Top 25 Women Business Builders” and Inc. Magazine’s “Top 10 Entrepreneurs of the Year.” She is a regular contributor to Forbes and Fortune. I spent the first decade of my career working in advertising. It was basically Mad Men with bell bottoms—complete with catcalls and intimidation. It was a toxic environment and it was not for me. My next few roles in PR and management consulting opened me up to a different kind of leadership. I was working with organizations and mentors who didn’t suppress my strengths because I’m a woman, but rather fostered them to help me become stronger. I was given opportunities to take on projects and lead teams well beyond my experience. At times, it felt like I was fighting above my weight. But I was seeing successful results and bringing something interesting to the table. It was during this time I was able to realize just how strong I was. Emboldened and raring to make a change, I returned to advertising. It was the 80s and a recession was on the horizon. Despite the agency’s success, I knew we could answer client needs with something smarter than bloated TV spots. We were missing a bigger opportunity. That stung. But it also lit a fire in me that changed my life. I walked out of that office knowing one thing was for damn sure—if they didn’t want to change things with me, I’d do it without them. I quit, cashed in a $16,000 IRA and started my own company, T3. As the agency grew, we had no trouble attracting top talent—many of them women. But as their personal lives progressed, I saw tough choices having to be made. I was losing some of my best people. So we took steps. The largest was T3 and Under, a program that lets moms and dads bring their new babies to work. It became a lightening rod for discussions among women in business and has even been recognized by the White House. My journey was not easy. There were scary days and months and arguably years, but we thrived. Along the trail, I’ve formed a clear philosophy about leadership and success. All of which has been shaped by my more than 40 years as a business owner, wife, mother, mentor, board member, business policy advocate, speaker, artist and Texas rancher. In fact, growing up in Texas and ranching Texas Longhorn cattle is the very place I learned the toughest lessons about learning how to brush yourself off and get back to business. I believe every woman has limitless power to make the life she wants. She just has to light her own fire. Refuge in people and place: Most of the photography on this site was taken at our Double Heart Ranch, a place I go to for inspiration, recharging, painting and family (with some hard work mixed in). I want to thank the people who helped capture my relationship to this sacred place: Mark Seliger, photographer; Kattia Solano, hair and makeup stylist; and Rebecca Gaddis, wardrobe stylist.